The project Art for Peace was designed by Regina Proença, philosopher and director of Iluminattis – Philosophical Studies Center since 2003, currently coordinator of Cultural Collective Out of the Box projects, in partnership with the artist Leticia Barreto, responsible for the art school Nextart. 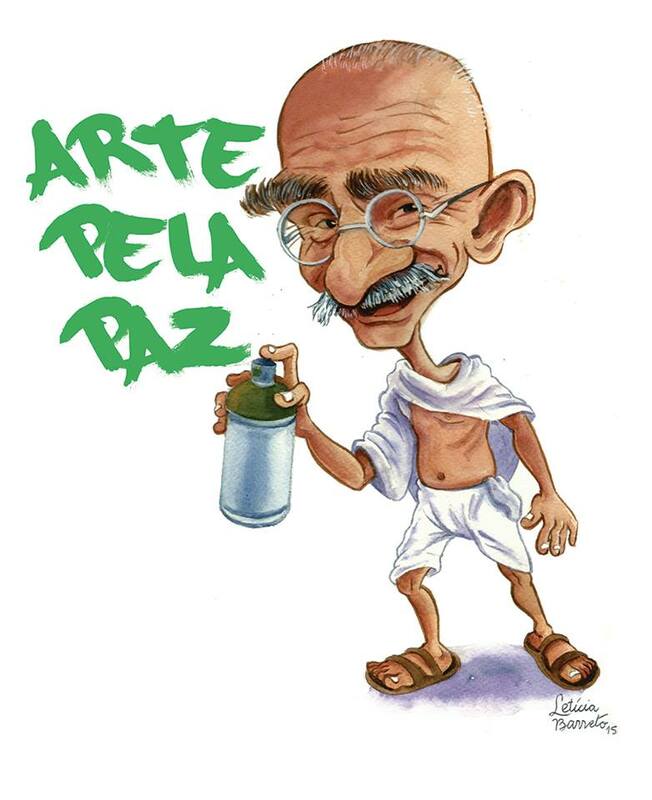 In the previous editions the exhibition was part of the cultural program of the Gandhi´s Week, there were four editions (2004, 2005, 2006 and 2007). In these projects, artists from around the country and some foreigners submitted their work via the Internet to a virtual exhibition divided into different categories: drawing, cartoon, photography, painting and video. The most voted by Internet users were selected for public display that was part of the cultural program of the Gandhi´s Week in different places of the city such as Fundec, SESC, Uniso, Senac, Iluminattis, etc. Inspired by street art movements that are flowerishing in every country, we decided to re-editate the project Art for Peace and broaden the range of the initial design options, we added the category Urban Art and now accept the works in graffiti, interventions and performances in public places. Urban Art – dates and locations for the performances of performances, installations and graffiti will be set according to the needs required by the projects that are submitted and selected. The graffiti must be sent as a sketch of the project, the wall to be painted is 3 x 3.3 meters. The six most voted works will have the opportunity to paint it on a very nice place of Sorocaba city, at a very important avenue between 01 to 03 April of 2016. How to submitt your work? Leticia Barreto is audiovisual artist and art educator. A scholarship from the Rotary International Foundation, studied Fine Arts at the Lorenzo de Medici Institute in Florence, Italy. She worked for 17 years as an art educator in Sorocaba. In 2007 she emigrated to Lisbon at the invitation of Nextart where she worked for six years as a teacher in drawing courses, painting and as a pedagogical coordinator. She completed the MA in Visual Arts and Intermedia at the University of Evora, Portugal. She returned to Brazil in 2013 where her art school reopened Nextart Brazil. Coordinates the activities of the Urban Artists group in Sorocaba.